You know what it’s like… waiting on hold. What is the best way to fill that time? When we say Marketing on Hold, we mean pertinent messages to clients while they are holding the line. In general, companies choose to provide information such as your URL, opening hours or business news, in combination with apologies for the wait and the music of their choice. The apology will obviously be recorded by your specific “company voice”. First impressions are the most important step in establishing a good client relationship. First contact often occurs by telephone, and can be crucial for the future. DEDACOM’s Marketing on Hold is a service that can change and even improve this first telephone contact. Waiting on hold will not only be more pleasant, but can even be useful. • MoH is a fully tailor-made service for your business, maintaining a professional feel for your telephone lines. • MoH turns waiting on hold into an informative and customer friendly experience. 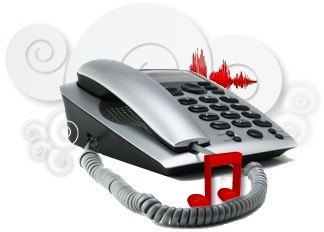 • Research by KPN (a Dutch telephone service provider) has shown that clients have the impression that waiting times are shorter when they hear music/Marketing on Hold. These days practically all telephone systems can handle both your system messages and your clients on hold. If this is not possible, DEDACOM can provide you with a module that will be linked to your telephone exchange to play the waiting messages as well as loading your system messages. Recording options: deliveries are digital. An MP3 file can easily be saved on a memory card to be inserted into the module. After all, the cassette age is long past, and even the good old CD is outdated thanks to SD-/SMC-cards and USB sticks. Studio DEDACOM can provide you with all styles of music. Our library extends from Main Stream to Custom Made Music. We will also take care of any BUMA/STEMRA dues.